There’s really only two MacGyver hacks in this episode—but wait! Don’t be upset, it’s a good thing. First, it happens to be a great episode. Second, when you don’t have a set number of hacks in an episode it just feels like the story uses these hacks rather than revolve around them. Overall, it was a great episode. I guess you can call it whatever you want. But how does it work? There are a few important things to go over. First—how do we see things? Suppose there is a pencil on a table. 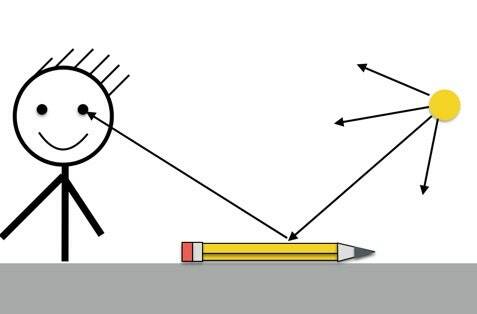 If you see that pencil, it’s because light reflects off that pencil and then enters your eyes. Here is a diagram (from my post on 5 Things Every Human Should Know About Light). Second—how does a window work? In the most basic form, a window could just be a piece of glass. When light hits glass, two things happen. Some of the light is transmitted and some of the light is reflected. Yes, this pretty much always happens. OK, I lied. There are some cases where all the light is transmitted and other cases where all is reflected. I can prove this to you. 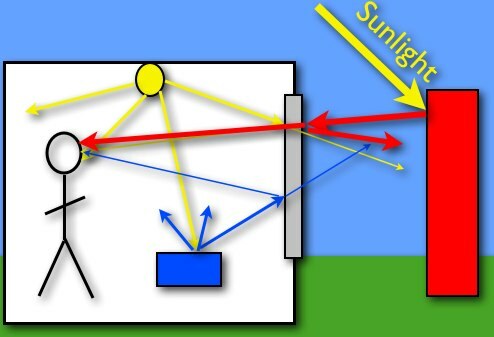 If you are inside a house on a sunny day, you can see outside but other people can’t see in. The problem is that the outside stuff is so bright that the reflected light is way more than the light coming through (from the inside) and you can’t see it. Here is a diagram (from this old post of mine). Now back to the “one way mirror”. The key is to have the room with the observers darker than the room with the people you want to watch. There is a door, but it’s trapped. It’s a trapped-door. Get it? OK, so MacGyver needs to bust this down but without people nearby in case it explodes (it does explode). He takes the battering ram weight and puts it on a skateboard. Then he run some string over a couple of pulleys so that he can get this thing up to speed and smash into the door. Here is a diagram (from my show notes) to see how you would set this up. The key to a pulley system is to set it up so that the distance the object moves is different than the distance the person pulls. In fact, this is the key idea to all simple machines (a compound pulley is indeed a simple machine). In the diagram above, if Mac pulls the bottom pulley (this is a top view) one meter, then there would need to be two meters of string move that way (since the string is doubled over). That means the skate-board and battering ram would move 2 meters for this 1 meter of pull. Yes, the skate board would move twice as fast as MacGyver. But you don’t get something for nothing. Although he only moves 1 meter for the 2 of the board, there would be twice the force on MacGyver. This is how simple machines work. Slowing down a car with a winch. MacGyver grabs the winch on the truck and then jumps to the truck with Murdoc. He wraps the cable around a post and then Oversight slams on the brakes. Both cars stop. Yes, the friction from the rear truck would indeed slow down the other car (if not stop it). However, since the cable is attached to the side of Murdoc’s truck, the force from the cable will also turn that truck. Once it get’s turn too much, it can’t even drive straight. Now both trucks are essentially sliding with rubber wheel interacting with the road. That’s why it stops.